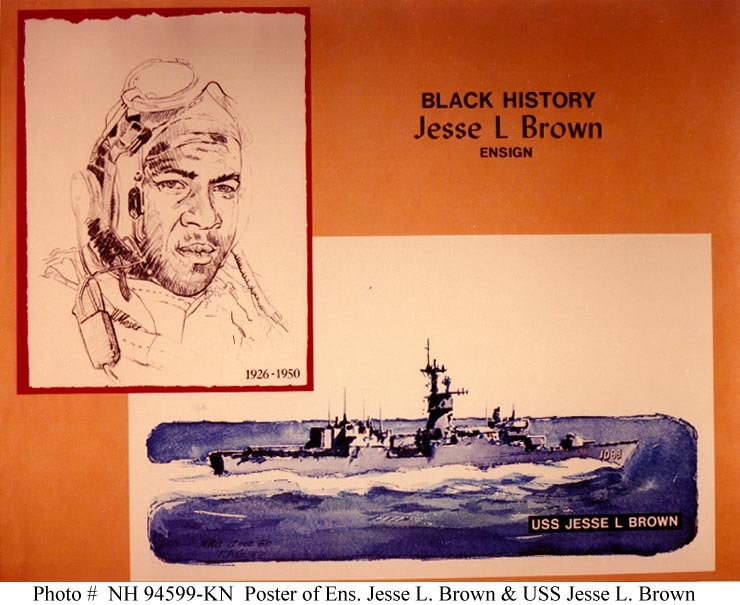 USS JESSE L. BROWN, a frigate, was named in honor of Ensign Jesse LeRoy Brown, U.S. Naval Reserve, the first African-American Naval Officer to lose his life in combat during the Korean Conflict. Born 13 October 1926, in Hattiesburg, Mississippi, he was commissioned an Ensign in the U.S. Navy on 15 April 1949. 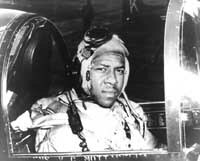 A pilot of Fighter Squadron 32, Ensign BROWN became a section leader who received the Air Medal for daring attacks against enemy lines of communications and troop concentrations at Wonsan, Chongjin, Songjin, and Sinanju. Leading his section in the face of hostile anti-aircraft fire, he courageously pressed home attacks that inflicted serious losses on the enemy and provided effective support for friendly ground troops. On 4 December 1950, while giving close combat air support to the Marines fighting near the Chosin Reservoir, undeterred by heavy anti-aircraft fire, he repeatedly attacked hostile troops and continued aggressive strafing runs until his plane was struck by enemy fire and crashed. Captain (then Lieutenant, junior grade) Thomas J. Hudner, received the Medal of Honor for extraordinary heroism in crash-landing his plane alongside the aircraft of Ensign BROWN and attempting rescue. Ensign BROWN perished in the wreckage of his plane. He was posthumously awarded the Distinguished Flying Cross for his exceptional courage, airmanship, and devotion to duty in the face of great danger. He gallantly gave his life for his nation in a manner which reflected the highest credit upon himself and the United States Naval Service. It covers his life up to when he retired from the Navy. Anyway, he was an aviator in Korea when Jesse Brown was shot down and I was trying to see if I could find any interesting photos. I think you’ll find his description of Jesse Brown’s shooting down in 1950 rather interesting. “Almost all my flights in December were close air support for the Marines fighting on the east side of Korea. They were consolidating their forces and moving down from the Chosin Reservoir area just to the north of Hamhung. Besides close air support, we would cover the surrounding area looking for Chinese troops. When we spotted some, it was unreal. There were more than I could believe and they seldom took much cover when we approached. On the 4th of December, I was leading a flight of 4 ADs north of the area while 6 F4Us were working closer to the reservoir area. I got a call that one of the F4Us was down so I proceeded to that area immediately. Just as I arrived, with the 3 other ADs, and spotted the downed plane, one of the other F4Us made a wheels up landing in the snow next to the downed plane. Immediately upon landing, the pilot ran through the snow to the downed plane. The pilot of the downed plane was Ensign Jesse Brown, one of the first black Naval Aviators. He was either pinned in his plane or so badly hurt he couldn’t get out. Meanwhile, his engine was smoking and there was danger it would burst into flames at any moment. I was the senior pilot on the scene. I sent the two remaining F4Us in the air to the Marine command position between Chosin and Hamhung to request a helicopter pick up of the two pilots. We continued to circle the downed planes while the helicopter was being sought. The pilot, who landed in the snow to help his shipmate, was able to use the radio in his downed plane to keep us abreast of what was going on. About an hour later, and it was now getting dark, a helicopter arrived to pick up the pilots. Ens. Brown died before they could free him from his plane. The other pilot was rescued. After the pick up, I formed up our planes and returned to the ship. Thank gosh for our night practice off of Hawaii for by the time we found the carrier it was pitch dark and a very low ceiling. I was fortunate to get aboard on my first attempt, as was my wingman. One of the F4U pilots made 4 attempts before he made it, much to the consternation of everyone on the ship. I found out on landing that the name of the pilot that attempted the rescue was Tom Hudner. There was much talk in the wardroom and ready rooms whether he should be court martialed for ruining a good Navy plane and possibly killing himself, or be given a medal for the attempted rescue. Tom was eventually awarded the Congressional Medal of Honor, as high as you can get. In the 70's the Navy produced several recruiting posters featuring African-Americans in the Navy. Hull Material: Steel hull, aluminum superstructure.